My family makes so much fun of me because I dissect my Snickers candy bars with a knife before I eat them. I have a really good reason for eating it this way though --- it tastes better! I like to slice off the chocolate on the sides and the top and eat that first. Next, I carefully cut off the nougat and peanut layer and eat that second. Finally, I am left with the caramel layer and I eat that with the bottom layer of chocolate - sooo good. I cannot possibly be the only person that eats a Snickers bar like this - right? 2. In the bowl of an electric mixer (or large mixing bowl if you're using a hand mixer), sift together the flour, sugar, cocoa powder, baking soda, baking powder and salt. In a medium bowl, whisk together the eggs, buttermilk, coffee, oil and vanilla. 4. Divide the batter evenly among prepared pans. Bake for 20 minutes and rotate the pans in the oven. Continue to bake until a toothpick inserted into the center of one of the cakes comes out almost clean (with a few moist crumbs), about 12 more minutes. Cool the cakes (in the pans) on wire racks for 20 minutes, then carefully turn them out onto cooling racks to cool completely. 5. Make the Nougat Filling: Melt the butter in a medium saucepan over medium heat. Add the sugar and evaporated milk, stirring until dissolved, and bring to a boil. Reduce the heat to low and cook for 5 minutes, stirring occasionally. Remove the pan from heat and add the marshmallow fluff, peanut butter, and vanilla extract, stirring until completely smooth. Let the nougat mixture cool to room temperature before using it in the cake. You can do this leaving it at room temperature or you can pop it into the refrigerator to speed up the process. Be sure to give a stir occasionally as it cools. Spread half of the nougat mixture over one cake layer and drizzle with a bit of salted caramel sauce. 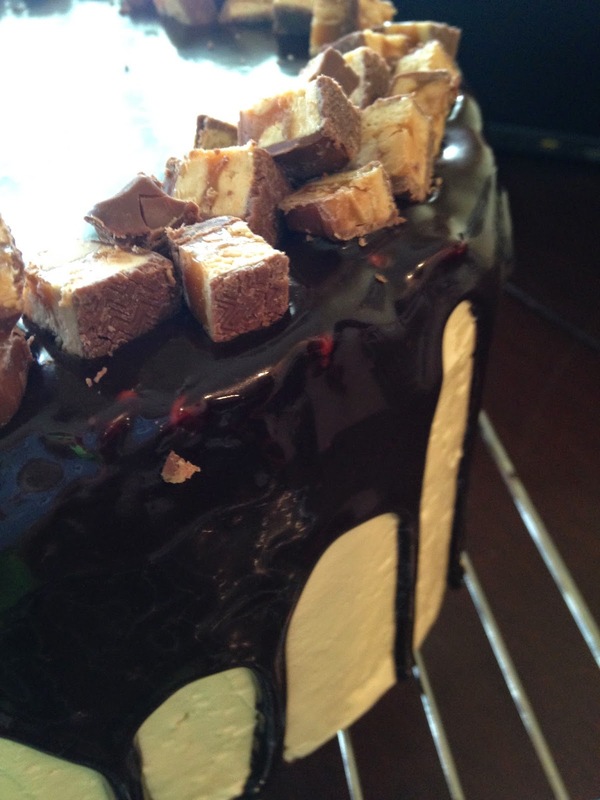 Repeat with another cake layer, remaining nougat and more caramel sauce. Frost top and sides with a thin layer of caramel buttercream. Refrigerate 30 minutes. Spread remaining buttercream on the sides of the chilled cake. Make a batch of chocolate ganache and spread over top of cake, allowing it to drip down the sides. 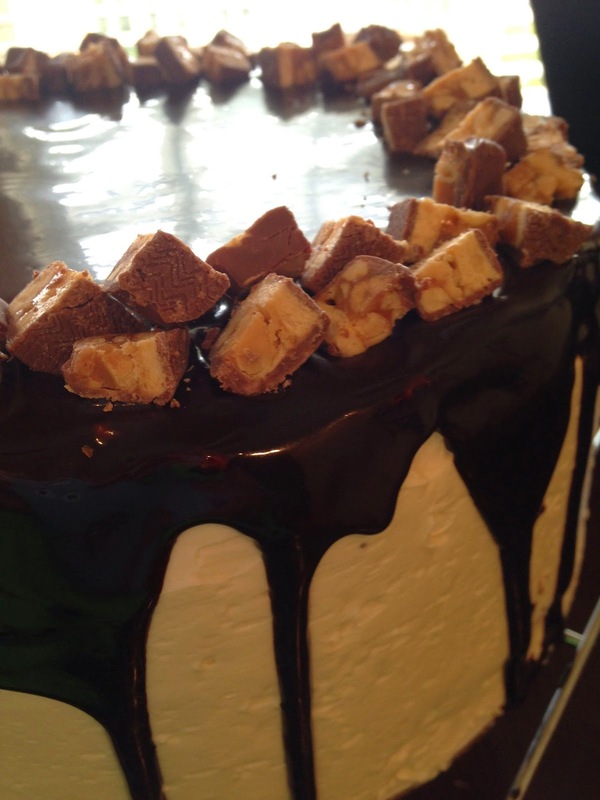 Decorate the cake with chopped Snickers Bars.